Members of the YFCU displayed their skills at the association’s annual sheep shearing competition that took place on the Wednesday morning of Balmoral Show. The competition was held in association with the British Wool Marketing Board (BWMB), The Northern Ireland Sheep Shearers Association (NISSA) and Lister Shearing Equipment Limited and consisted of two sections – novice and advanced. In the novice competition, judges named Philip Buchanan, Gleno Valley YFC as the YFCU sheep shearing novice winner for 2018 and he received the John Gilpin Trophy. 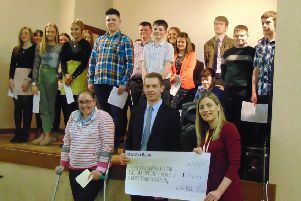 Second place went to Stephen Wilson, Gleno Valley YFC, and third place went to Matthew Robinson, Gleno Valley YFC. It was then the turn of the experienced shearers to show their craft at its best in the YFCU advanced sheep shearing competition. Competitors sweated it out in a tough contest with the top scorers making it through to the final. In the final, Russell Smyth, Coleraine YFC, secured the top place and was presented with the Lister hand piece trophy. Second place went to Sean McCollum, The Glens YFC, and third place went to Chris Coulter, Straid YFC. Stephen Morgan, Spa YFC, was also awarded a prize for the quality of the sheep shorn in his pen. The association would like to thank The Northern Ireland Sheep Shearers Association (NISSA), British Wool Marketing Board (BWMB) and Lister Shearing Equipment Limited for their ongoing support of the YFCU sheep shearing competition. The YFCU would like to extend their thanks to the sheep shearing committee at the Royal Ulster Agricultural Society for ensuring the smooth running of the competition on the day.